Tip o' the hat to Marco Langbroek for passing along this image of the Campitello Quarry birch-tar hafting mastic adhering to a couple of what look like exhausted bifaces. Unfortunately this stuff doesn't write itself, and no critique is possible without some background research and a close reading of the data presentation. All I can do is beg your forbearance, and thank you for your patience. The article in question is another one suggested by Marco Langbroek, Mazza et al. 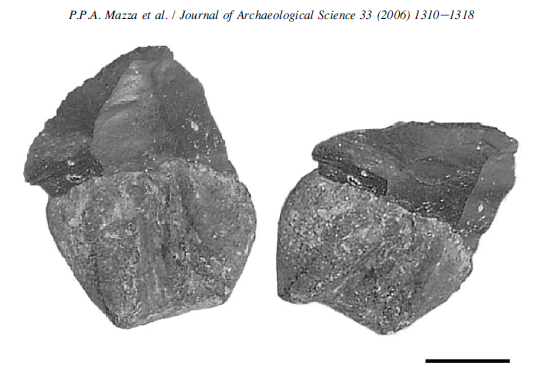 's 2006 'A new Palaeolithic discovery: tar-hafted stone tools in a European Mid-Pleistocene bone-bearing bed,' Journal of Archaeological Science 33:1310-1318. It's interesting that a material derived from a biological source can persist for so long in wet ground with no apparent change. Do you know if ancient birch tar retains its thermoplastic properties as if it were new, or do chemicals volatize out of it over time like happens in the formation of amber?